We’re delighted to announce a full programme of events in Suffolk from 18-24 June to celebrate the 20th anniversary of Refugee Week and the contribution that refugees make to our community. 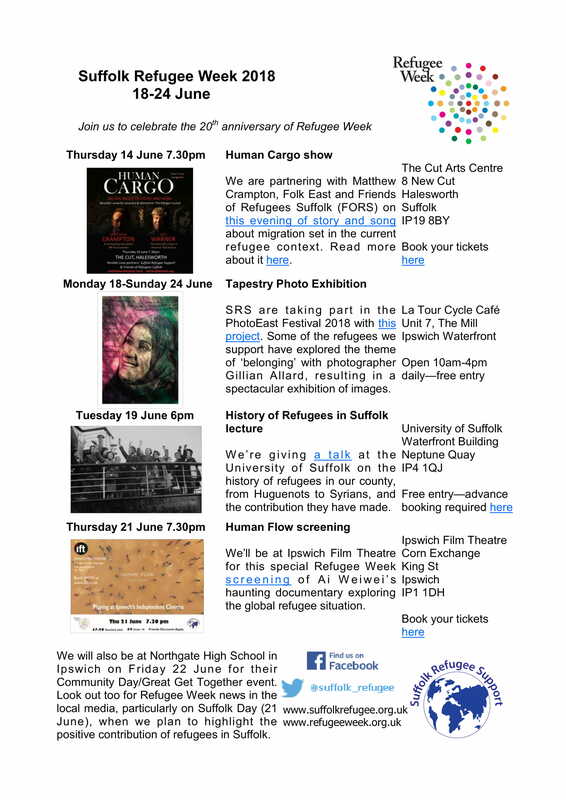 We’re taking part in an evening of story and song about migration in Halesworth, a refugee photography exhibition on Ipswich Waterfront, a screening of a film about the global refugee situation and delivering a talk on the history of refugees in Suffolk. We’ll also be out and about talking to local schools and the media about refugee issues. You can download our full Refugee Week programme here – we hope to see you somewhere during the week!